It is with much sadness that we learned about the passing of our friend and fellow writer, Bern Nix, who died May 31st, 2017 at the age of 69. Bern first started writing with us during the Fall of 2015 after seeing a flyer about our Writers’ Workshop in the Chelsea neighborhood. He quickly became one of our valued “regulars” through the Fall and Spring sessions thereafter, adding his thoughtful wisdom to our discussions, and his insightful essays to our anthology and blog. As humble as he was wise, Bern wrote about his life in music from a perspective that belied his notoriety as a jazz guitarist. 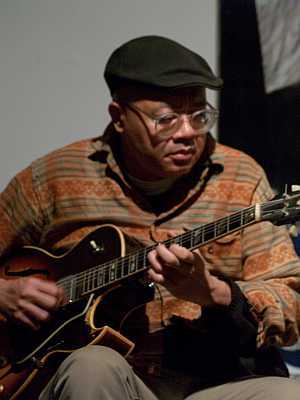 He was, we would have to learn through independent research, well-known for his contributions to the avant-garde harmolodics style, and had once been lauded as a top ten jazz guitarist by Down Beat magazine. Much like the improvisational music he played, his writing unfolded through ethereal commentary, punctuated by wry humor and clear imagery. His art – in whichever genre – was an authentic and unique gift.